BANDOLERO! was made at an interesting time in the history of Western movies. 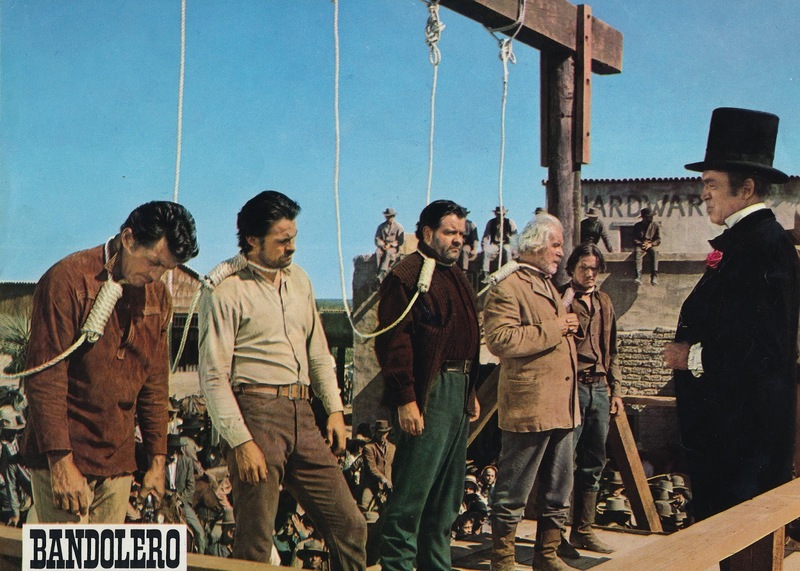 Sergio Leone’s “Man With No Name” trilogy had begun to exert their influence on American filmmakers (HANG EM HIGH, SHALAKO). Traditional Hollywood Westerns were still being produced (FIRECREEK, 5 CARD STUD), but in a year’s time, Sam Peckinpah’s THE WILD BUNCH would change the Western landscape forever. Andrew V. McLaglen’s BANDOLERO! is more on the traditional side of the fence, though it does exhibit a dash of Spaghetti flavor in its storytelling. Outlaw Dee Bishop and his gang attempt to rob a bank in Valverde, Texas. The heist is going well until rich Nathan Stone walks in with his beautiful Mexican wife, Maria. Stone tries to break it up, and gets shot for his troubles, thus alerting the attention of Sheriff July Johnson and his deputy, Roscoe. The lawmen successfully catch the gang as they’re leaving the bank. Stone dies, and Dee and his men are now sentenced to hang. By the way, this all happens before the opening credits! Dee’s brother Mace gets wind of his wayward brother’s plight and, after ambushing the hangman, helps Dee and his crew escape the noose. July forms a posse to track down the Bishop gang. While everyone’s away, Mace finishes what Dee started and robs the bank himself! Dee and his men ambush the posse, and take Maria hostage. The Bishop brothers, with newly widowed Maria in tow, head across the Mexican border, with the posse doggedly pursuing them. To get free, they must cross “territoria bandolero”, a lawless stretch of desert where bloodthirsty bandits rule, men who take pleasure in “killing every gringo they can find”. The film then essentially becomes a chase through dangerous territory, with the Bishops trying to stay a step ahead of both the posse and the murderous bandits. July’s posse, amateur townsfolk, get picked off one by one, while the gang’s infighting threaten to do them in. The posse finally captures the outlaws in the deserted town of Sabinas, but must free them when the bandoleros attack. 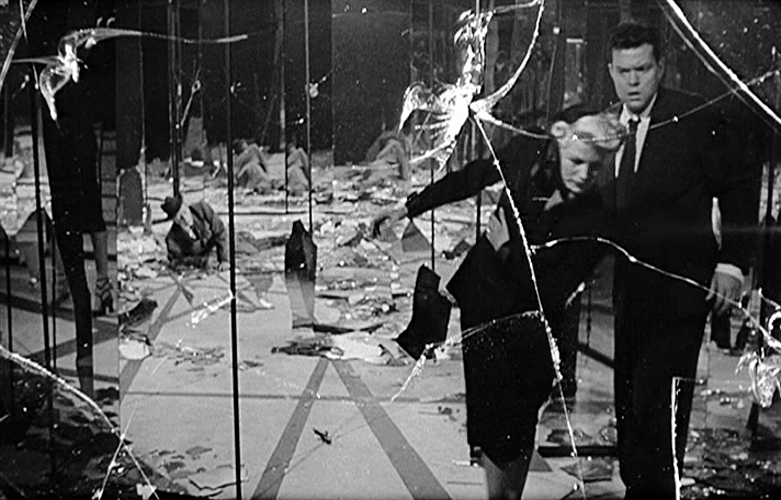 This part of the movie echoes RIO BRAVO, with the protagonists trapped surrounded by killers. It was actually shot in Alamo Village, a set built in Brackettville, Texas for another stand-off Western, John Wayne’s THE ALAMO. Dean Martin and James Stewart star as Dee and Mace Bishop, brothers who fought on opposite sides during the Civil War, and chose paths on opposite sides of the law. Both actors were comfortable in the saddle, Stewart well noted for his 1950’s oaters with director Anthony Mann (WINCHESTER ’73, BEND OF THE RIVER, THE NAKED SPUR), while Dino had worked with both John Wayne (RIO BRAVO, THE SONS OF KATIE ELDER) and Robert Mitchum (the aforementioned 5 CARD STUD). Martin’s cavalier attitude contrasts well with Stewart’s laconic, stuttering screen image, and they make a believable pair of brothers. Raquel Welch is Maria, and she’s a vision of both beauty and strength. I’ve talked before about my life-long obsession with Raquel , and she gets a lot of close-ups here (part of the Leone influence, no doubt). Her Mexican accent is passable, and BANDOLERO! gives her a chance to show off her acting chops rather than just her body. The late George Kennedy plays Sheriff July Johnson, while Andrew Prine (the cult classic SIMON, KING OF THE WITCHES) is Deputy Roscoe. If those character names sound vaguely familiar, thank author Larry McMurtry, who appropriated them as the sheriff and deputy who chase an outlaw named Dee in one of my favorite books, LONESOME DOVE. The supporting cast is a Familiar Face lover’s dream, starting with Will Geer as the mean, ornery outlaw Pop Chaney, a long ways from his role as Grampa on THE WALTONS. The chuck wagon-full of Westerns vets includes (take a deep breath and hold on to your Stetson), Don ‘Red’ Barry , Roy Barcroft, Harry Carey Jr, Pat Crenshaw, Big John Hamilton, Jock Mahoney, Sean McClory, Denver Pyle , Guy Raymond, Clint Ritchie, and the ever-popular Dub Taylor. Andrew V. McLaglen was the son of Oscar-winner and John Ford stock player Victor McLaglen . Andrew cut his Hollywood teeth as an assistant director, then graduated to directing the B-Western GUN THE MAN DOWN. 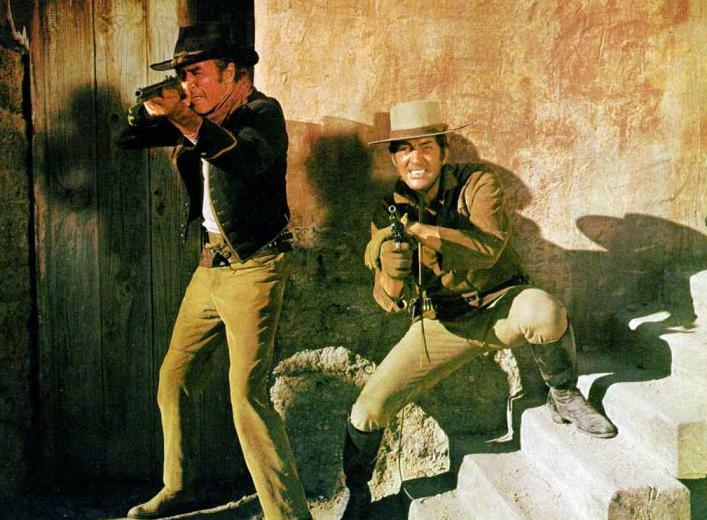 After spending years as lead director of the TV show HAVE GUN WILL TRAVEL, McLaglen’s Western features included MCLINTOCK!, THE RARE BREED, SHENENDOAH, CHISUM, CAHILL US MARSHAL, THE LAST HARD MEN, and the TV movie THE SHADOW RIDERS. DP William Clothier was a favorite of both Ford and Wayne, and his camerawork here enhances the picture with great shots of the Texas background. Clothier was a veteran camera operator (he worked on WINGS and KING KONG) who made the leap to DP in the 1950’s. He won two Oscars for his work on Westerns, THE ALAMO and CHEYENNE AUTUMN. Some of his other films were TRACK OF THE CAT, THE HORSE SOLDIERS, THE COMMANCHEROS, THE MAN WHO SHOT LIBERTY VALANCE, THE CHEYENNE SOCIAL CLUB, and his last, THE TRAIN ROBBERS. James Lee Barrett’s screenplay is both literate and adult in its themes. Maria tells of being a pre-teen whore in Mexico, while Dee is unrepentant in his ways until the very end. Hollywood was changing, and the Western film was changing along with it. That “dash of Spaghetti flavor” I mentioned earlier is in those themes, as well as the use of gore, with people getting brutally hacked to death and onscreen blood (though not nearly as graphic as what’s on screen today). 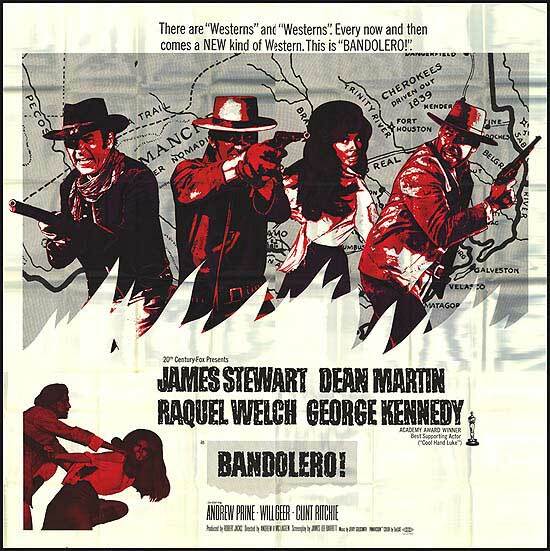 Hollywood Westerns were growing up, and BANDOLERO! serves as a bridge between the West of John Ford and the West of Sergio Leone (and to an extent, Sam Peckinpah). Great review! I learned a lot along the way, an added plus. Thanks! Thanks, Chuck! I try to cram these reviews with as much background as possible. Glad you enjoyed it. Yup, the Through The Shattered Lens newsletter is how I usually get here. And while I’m on the subject of “getting here”, and there, I’d like to help spread the word about your great blogs. The fact is – and please keep this to yourselves, boys and girls – when I’m not busy crushing crime, foiling nefarious villains and reading your blogs (usually all at the same time), I work for a large metropolitan daily online news service. Really. And I’ll be contacting you soon about writing an article on your site(s) and your backgrounds. So, watch the skies for my signal! … or your inboxes. It might be foggy. Very enjoyable walk down your BANDOLERO Memory Lane!